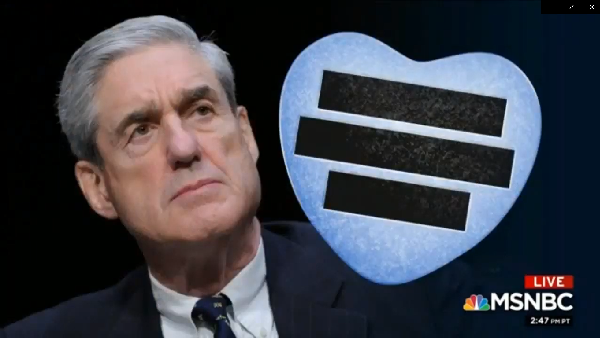 Courtesy of Meet the Press yesterday..
Each in our measure, the rest of us mourned with them. — and it was Ash Wednesday, when ashes from palm crosses representing Christ’s hosannah-filled entrance into Jerusalem are smeared on the foreheads of believers (lower panel, above)..
A day set apart for love, a day for mourning. And each in turn could provide a potential shooter with an added impulse to act on this particular day. 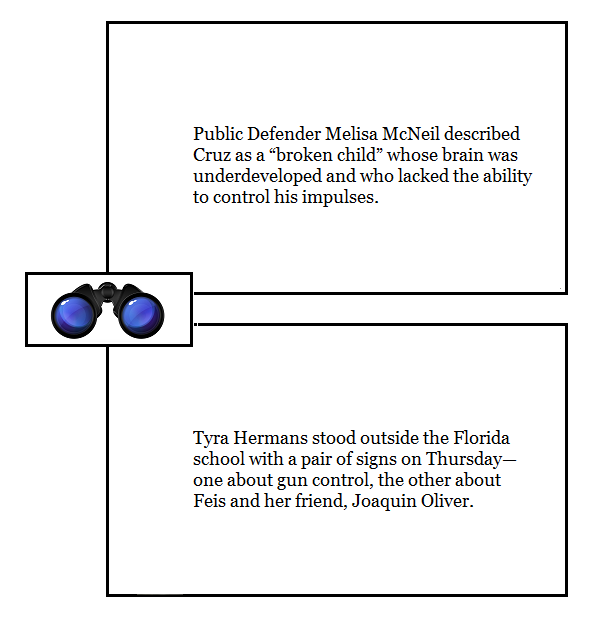 — or how to control the access to semi-automatic weapons of people who are slipping dangerously into forms of mental distress, while respecting both the right to privacy and the right to bear arms (lower panel, above). Impulse control, or gun control? Marjory Stoneman Douglas High School is too much of a mouthful: Parkland will be the name etched in memory, alongside Columbine, Virginia Tech, and Sandy Hook. Such names are invoked, not spoken. 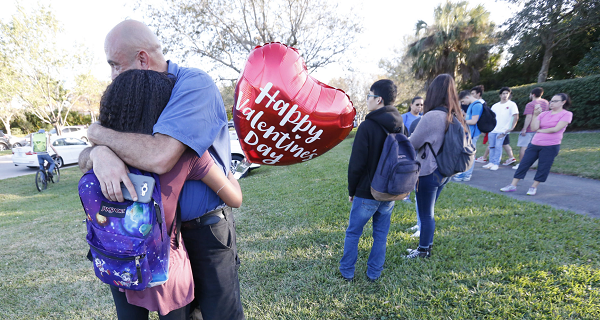 Is there perhaps a connection between the school shooter issue and the national conversation on sexual harassment, such that a major shift in attitudes towards sexual harassment would naturally translate to, or facilitate, a similar shift regarding gun control? Are these in fact two conversations — waves on the same wave-front — “whose time (for change) has come”? Would each benefit from their being discussed together? Everyone in America has seen the latest results of another dangerously mentally ill loner with family members who were in denial about the severity of his condition or disconnected from him. 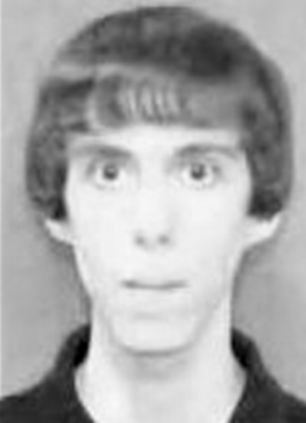 The killer, Adam Lanza, shot shot his own mother in the face before slaughtering twenty elementary school children and the heroic teachers and their principal who had sought to protect them, belonged in an institutional setting. The same can be said for homicidal schizophrenic Jared Loughner who shot Congresswoman Gabby Giffords, James Holmes, the Colorado shooter, has a gag order on his murder trial but his defense lawyers have already disclosed that their client is mentally ill in blocking access to his diaries under physician-client privilege. Seung-Hui Cho, who committed the Virginia Tech massacre, had previously stalked women, made suicidal threats and been ruled “an imminent danger to himself and others” was set free and unwell to be treated on “an outpatient basis” that never happened. Predictably, a debate about gun control has erupted in the aftermath of senseless deaths. However, other countries are as heavily armed as the United States (in a few cases, more so). These countries also have severely mentally ill people, yet they don’t have the mass shootings that have become a dark cultural phenomenon we see here in America. Or when on the rare occasions they do, the shooter is likely not to be insane, but a professional terrorist. There have also been calls for improved school security ( the Obama administration and Congress cut school security grant funds in 2010 and 2011), stationing policemen in schools and even arming teachers, citing the example of Israeli schools and the Pearl High School shooter who was stopped by an assistant principal with a .45. While more security is a reasonable precaution and a good idea, short of turning our schools into windowless, prison-like, fortresses and giving the staff AK-47’s, anybody utterly willing to die in order to kill someone else stands a pretty good chance of success. If all guns vanished tomorrow, the crazies will use car bombs and IEDs instead; mass shootings are a “motivated crazy person” (or terrorist) problem – criminals with economic motives do not carry out these kinds of attacks. We need to revise our attitude toward mental illness with greater public education and access to mental health treatment, especially emergency treatment. Most mentally ill people are NOT dangerous but the warning signs of psychotic breakdown should become as widely recognized as the dangers of cigarette smoking. For the very few people who are mentally ill and violent, we need to have public heath authorities accept that some degree of active supervision is required to ensure they receive treatment and take their medication if they are to live independently, and if they refuse, to institutionalize them temporarily until they do so. The key variable here is *violence* not just mental illness and strong due process safeguards must be in place to protect the individual and ensure they receive appropriate treatment with dignity. Schools need much better training and planning for “active shooter” situations. At present, most schools have safety plans that emphasize locking students in enclosed rooms from which there seldom are any escape routes and the staff passively waiting for instructions from higher school authorities or police. While these plans may be good for unarmed intruders of unknown intent, they are dangerously counterproductive for heavily armed active shooters. 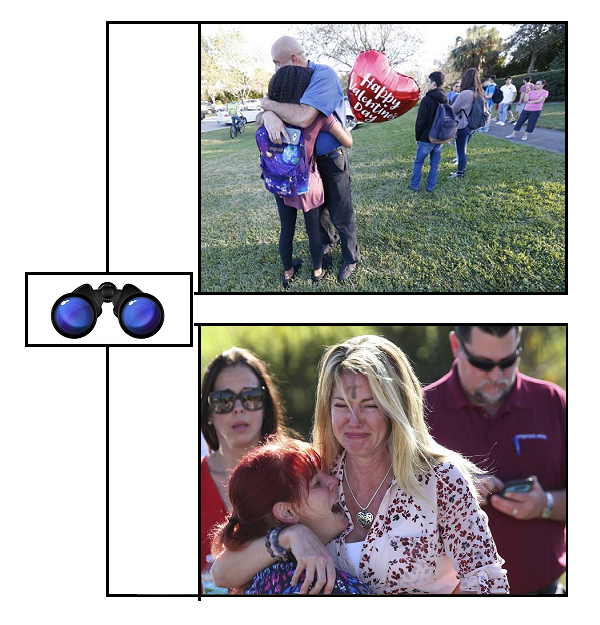 Schools generally lack enough secure rooms with doors that can delay such intruders for more than a few seconds and the standard emergency plan emphasis on “sitting tight” discourages the staff from engaging in reasonable risks to quickly evacuate students when the intruder is elsewhere in the building, or if possible, tactics to evade or if need be, resist, the shooter. Michael Few is a retired military officer and former editor of the Small Wars Journal: we are honored to offer our readers this guest post by a good friend of this blog. This fall, I’m hoping to begin teaching high school social studies as well as an elective on Global Issues or Wicked Problems (WPs). WPs are those messy, seemingly intractable problems that seem to evade solutions from conventional planning and decision making methods — terrorism, poverty, water rights, etc… These types of courses are already being taught in the school system where I live, and my hope is that I will be able to become a force multiplier given my experience and background. Eventually, if this elective course takes off, then I would like the final project to be a collection of TEDx talks, where the students describe a problem, discuss past failed efforts to tame the problem, and offer coping strategies or new solutions. As I am doing my initial reconnaissance of the student demographics, the first striking data point is their age. The incoming freshman class would have been born in 1998, and the senior class born in 1995. A second surprise that I received is the socio-ethnic backgrounds. Along with the expected mix of white, black and Hispanic children, my school district has a significant first generation Indian population, whose parents teach or work in the Research Triangle Park or surrounding universities. Moreover, there is a minority of Burmese refugees who have found a safe home after fleeing a repressive regime. How do they see and understand the world? The attacks of 9/11 were but a faint memory; the Cold War is ancient history. Their childhoods were formed with the Iraq and Afghanistan wars in the background, and their pop-culture heroes are Navy Seal Team Six and Call to Duty video games. Drone strikes and the intervention in Libya are normal for them. It is the way things are. We fight terrorists in other countries in order to protect our way of life. But what is a terrorist or an insurgent? Is it simply someone that disagrees with you? These students have much bigger problems to solve than simply pacifying villages in the remote areas of modernity. By 2040, when these students are in the prime of their lives, the world population is expected to be nearing nine billion with increased competition for basic resources as the world passes through peak oil and peak fresh water. If the United States is to remain strong, then these children are our hope. They will be tasked with leading the nation, finding new solutions to coming crisis, and developing innovation in technology, science, governance, and medicine. As I am developing my teaching philosophy, I am using the same process that served me well as a commander in the military. My purpose is to help develop, mentor, and coach: 1. leaders of character, 2.involved citizens in the nation who understand that rights must be complimented by responsibilities, and 3. the individual self-confidence to pursue a good life respecting themselves and others. Initially, I want to challenge them to rethink what they’ve been taught or think they know. I want my students to think for themselves and determine what right should look like. Whoever gives even moderate attention to human affairs and to our common nature, will recognize that if there is no man who does not wish to be joyful, neither is there anyone who does not wish to have peace. For even they who make war desire nothing but victory — desire, that is to say, to attain to peace with glory. For what else is victory than the conquest of those who resist us? And when this is done there is peace. It is therefore with the desire for peace that wars are waged, even by those who take pleasure in exercising their warlike nature in command and battle. And hence it is obvious that peace is the end sought for by war. The high ground is in the eye of the beholder. Some people cheered 9/11, including a few American radicals. With multiple-audiences watching 24/7, some will disapprove of our merely existing and bitterly resent and deny the legitimacy of our fighting back because they prefer us defeated and dead. Other audiences are more fair-minded and these are a good barometer – if we are winning them over, securing their admiration and isolating our opponents, our moral behavior in the big picture is apt to be reasonably on track. If we are repelling them, isolating ourselves, driving others to the side of our enemies, then chances are fairly good that we are going astray. Zen’s point is well-taken, but I disagree. Following a moral life is not based on how others feel about you. It is through living a life that subscribes to your believed philosophy, spiritual norms, and values and beliefs particularly when you have to make an unpopular decision. ’It is well that war is so terrible,’ Confederate General Robert E. Lee once said, ‘lest we should grow too fond of it.’ For him, and generations of military leaders before and since, the carnage and other costs of war have driven a sense of reluctance to start a conflict, or even to join one already in progress. Caution about going to war has formed a central aspect of the American public character. George Washington worried about being drawn into foreign wars through what Thomas Jefferson later called ‘entangling alliances.’ John Quincy Adams admonished Americans not to ‘go abroad in search of monsters to destroy.’ Their advice has generally been followed. Even when it came to helping thwart the adventurer-conquerors who started the twentieth century’s world wars, the United States stayed out of both from the outset, entering only when dragged into them. Today, war has become too easy and not too terrible. With our global hegemony in military strength, we can force our will at any time and any place. But, what is the right thing to do? These are some of the questions that my students will eventually have to answer.